Garlicis a must-have in the urban garden. It’s a must-have in any garden for that matter. Along with onions, garlic is one of the most used and beloved vegetables and by growing it yourself you will have a new appreciation for the plant and the delicious dishes that you can make from it. One of the cool things about growing garlic is that you can plant it in fall or spring. A historic tradition dictates that you should plant garlic on the shortest day of the year, but there is not horticultural basis for it. Few garden vegetables are as easy to start growing as garlic. It is really as simple as lightly pressing a garlic clove root-side down into loose, good quality, weed-free soil to a depth of about 2 inches. It enjoys and even thrives in cooler weather, but extreme cold may damage it. Simply protect your garlic with a layer of straw should the weather become extremely cold. Garlic is ready to be harvested when the leaves have turned yellow and begun to fall over. It is best to wait until at least 2/3 of the plant is brown and fallen over before removing the garlic from the ground. You can also cut the tops of the leaves during the growing season and add them to your favorite dishes, just don’t cut more than an inch at a time or you will stunt the growth of the garlic itself. I began growing garlic chives a few weeks ago from some sprouted cloves – they’ve grown like crazy. Next I’ll attempt to put some organic garlic in the ground. I can’t believe how easy it is to grow! 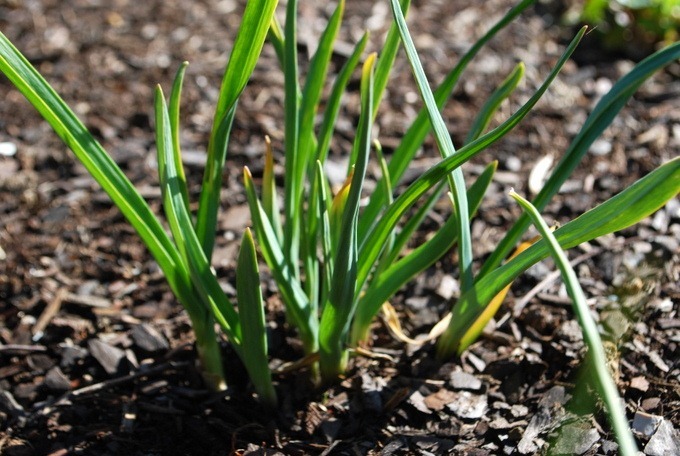 It’s a great starter plant for folks – it really makes you feel good to see life springing out of something that would have ended up in the compost pile. I’ve just discovered your blog through Google Blog Search – I can’t wait to keep reading more of it. How many heads of garlic do u think you’ll eventually get? Happened on this site from just looking around at stuff. Very glad I found this. Very informative and helpful. Will definitely have this one saved. We’re so glad to have you. Thanks for visiting and. 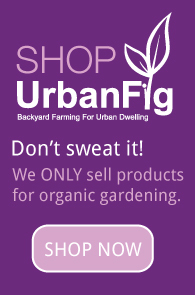 Let me know if you have any particular gardening questions. I’m here to help! Garlic is a staple in our household, and we couldn’t live without it! After tilling down the garden in the fall, Winter Rye is sowed for the winter cover crop except for a narrow strip across the end of the garden. Rows of garlic are pressed into the newly tilled soil and they are ignored for the rest of the winter. Come spring, the tops are broken over and allowed to “die” (many prefer to let the tops dry naturally instead of forcing them). When the tops have all turned yellow to brown, the garlic is dug and hung by the tops to dry. They are kept hanging until they are needed for cooking. My grandparents used to braid the garlic tops into big ropes of garlic, but I’ve never had the patience for that. We planted some garlic in our garden and something is digging up the cloves and carrying them off?!? What animals eat garlic cloves?